"I created this recipe from looking at a few different ones online and choosing my favorite aspects of each. This is vegetarian but there are many bibimbap recipes with beef or chicken marinades, if you want to add beef or chicken to this dish." 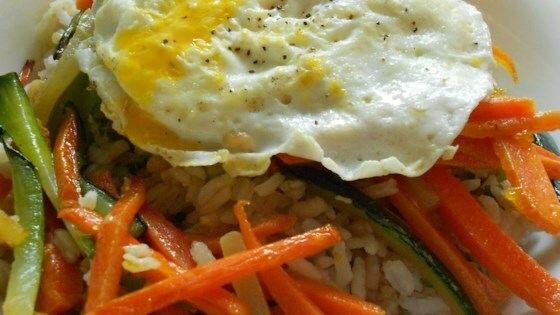 Colorful, nutritious and delicious Korean classic. Fairly bland, the only flavor it has was from the hot sauce. I put the hot sauce on the side so I could see what it tasted it liked without the hot sauce and it wasn't that flavorful. Delicious!!! I would have preferred 2 eggs (my husband had 2 and wished he had 3) but that might be personal preference. Can't wait to make again!